/ Modified jul 31, 2018 12:34 p.m.
Three Golder Ranch Fire District members pose with a Tucson Fire Captain before deploying to the Carr fire in Northern California. From Left, GRFD Engineer Michael Waldorf, GRFD firefighter Scott Petersen, TFD Captain Eliot Anderson and GRFD firefighter James Cissell. Arizona firefighters and disaster volunteers are on the scene of the Carr fire in Northern California. 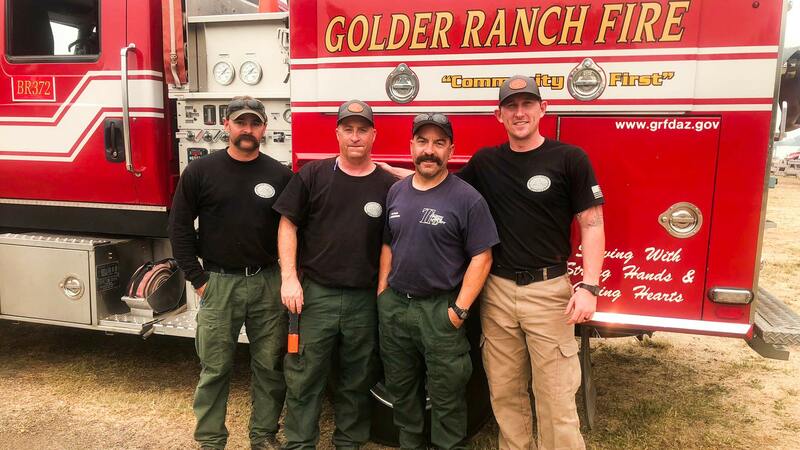 One of the city's experienced wildland firefighters joined a crew from the Golder Ranch Fire District that left for the Redding area last week, followed on Sunday by two more Tucson firefighters who joined a team from the Sunsites-Pearce Fire District. All are now on the fire lines near Redding. Tucson Fire Deputy Chief Jeff Thompson says crews can use their time on the California fire to qualify for certification as wildland firefighters. "We're building up our wildland capability within Tucson, so we're sending our guys up not only to help California but to reap some of that education and bring it back to train our structural guys in wildland [firefighting]," Thompson said. "The weather and the sheer size of the fires made it really difficult. Unfortunately, to get any kind of credentials or qualifications to be a wildland firefighter you have to go on a fire, so it is a mutually beneficial prospect," Thompson added. A spokeswoman for the Golder Ranch Fire District said her agency now has 11 firefighters deployed to California. Besides the firefighters, five volunteers from the Southern Arizona Chapter of the American Red Cross have flown into the fire area, to help run shelters set up to house evacuees. The Red Cross teams will serve a minimum of two weeks on the scene, more if needed.